To access the Leapfrog® 3D model of Pardo Click Here. The Pardo Paleoplacer Gold Project is located in Ontario, Canada, 65 km north east of the world class mining district of Sudbury (Figure 1). The property has excellent year round access by road, which is less then 1.5 hours from Sudbury. The Pardo property consists of 167 square km's of mineral claims covering the target paleoplacer geology. Inventus owns a 100% interest in the property (outlined black on Figure 2) after acquiring the remaining interest in the Pardo JV on November 30, 2016. Part of the property is subject to a 3% net smelter return royalty, of which 1.5% can be purchased by Inventus at any time for C$1.5 million. The Pardo Project is a conglomerate-hosted gold deposit within rocks of the Huronian Supergroup, a 2.4 billion year old sedimentary basin. Ancient Precambrian Sedimentary basins such as the Huronian are known to contain large paleoplacer gold deposits. 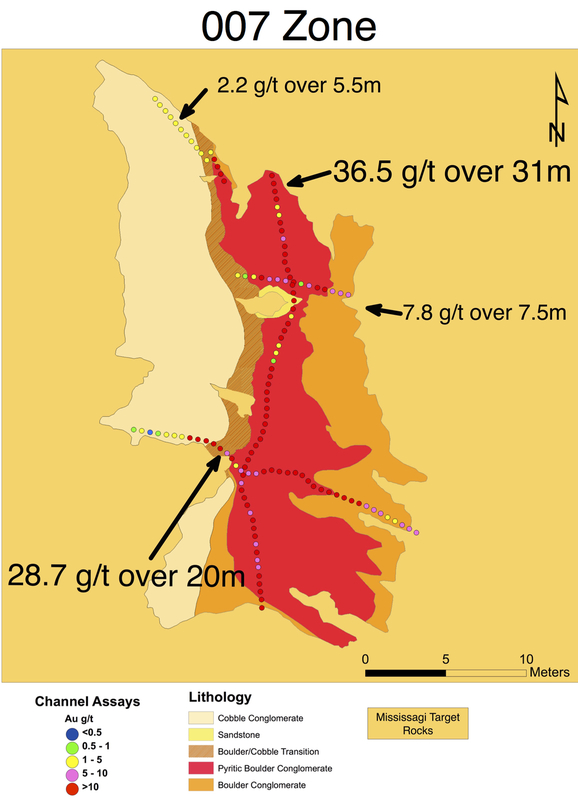 One such setting is the famous Witwatersrand basin in South Africa, which is considered the largest gold provenance in the world having produced approximately 40% of the worlds gold supply (Figure 3). Figure 3. Size comparison between the Huronian (left) and Witwatersrand basin (right). Inventus’ team has identified gold bearing conglomerate reefs within two separate formations. The conglomerate reefs are extensive, flat lying layers ranging from 1 to 4 metres thick. In some areas these reefs are stacked and separated by interbedded sandstone. The basal formation, the Matinenda, is composed of pyritic quartz pebble conglomerate and underlies the Mississagi Formation, a polymictic cobble to boulder conglomerate (Figure 4). The two formations contain anomalous gold values over the entire property that spans 13 km north to south and 3 to 5 km east to west. Figure 4. Example of Mississagi boulder conglomerate from Godzilla Zone. Numerous surface exposures of the gold bearing conglomerates have been identified over the Pardo Property since its discovery (Figure 5).